Description: With Pickens U18B in tow. The crew left to grab something to eat. I grabbed a photo! Description: PICK 9503 sits next to an old box car used as an office office. Title: PICK 9503 coughing it up again! Description: Waiting in the yard after a days work. 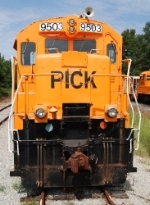 Description: PICK 9503 in Gluck, SC.